The slowdown in the housing recovery continued in February as the pace of both housing starts and building permits declined. The Commerce Department said new construction fell 8.7% from the annual rate in January and was down 9.9% from February 2018. The pace for permits also declined for both periods. Overall, residential starts are about at the level at which they entered the Great Recession, nearly half the peak set in early 2006. 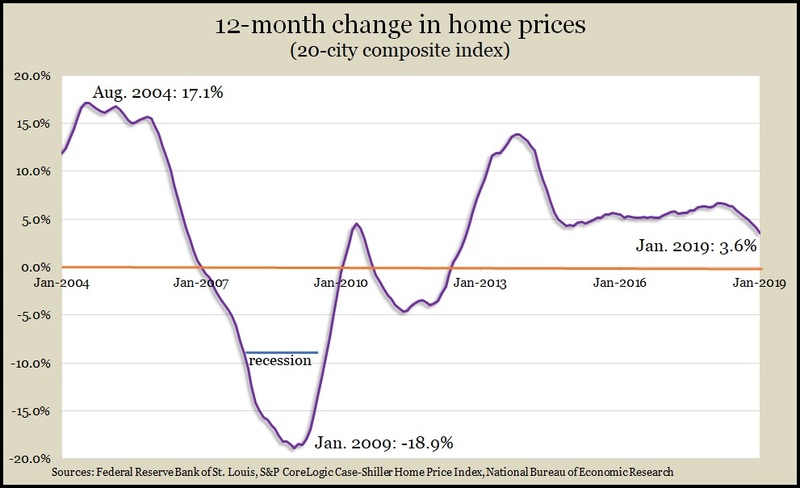 Price growth for houses also continued to ebb. According to the S&P CoreLogic Case-Shiller home price index, the 12-month price increase in the 20-city composite index was 3.6%, down every month since reaching as high as 6.7% last March. A housing economist with Standard & Poor’s said a recent drop in mortgage rates, combined with lower house prices, could help stimulate more home buying. March consumer confidence edged down from February, suggesting slower prospects for U.S. economic growth. The Conference Board said its surveys found consumers dimming their mood for both current conditions and the outlook. The business research group cited the 35-day federal government shutdown, volatile financial markets and a weak jobs report for undermining the confidence of consumers, whose spending drives about two-thirds off the U.S economy. The U.S. trade deficit narrowed by 14.6% in January one month after growing to the biggest gap since 2008. The Bureau of Economic Analysis said the value of U.S. exports rose 0.9% in January while imports declined by 2.6%. Much of the swing came from China, from which imports fell 14% following a surge in December tied to a deadline for increased tariffs that subsequently was postponed. Also in January, U.S. exports of soybeans rose—also tied to trade disputes with China. The U.S. economy grew at an annual rate of 2.2% in the fourth quarter, slower than the 2.6% previously estimated by the Bureau of Economic Analysis. The bureau’s report showed gross domestic product wasn’t as robust because of weaker spending by consumers, businesses and the government. For the fourth consecutive quarter, housing investments declined. Full-year GDP grew 2.9%, the highest in three years. The Federal Reserve’s favorite measure of inflation still came in shy of its 2% target. Inflation grew at an annual rate of 1.8%, vs. 1.6% in the third quarter. The four-week moving average for initial unemployment claims fell for the fourth time in five weeks, signaling continued tightness in the hiring market. According to data from the Labor Department, jobless applications have been below the all-time average every week since early 2013, a sign that employers are cautious about letting workers go. That helps support consumer confidence. The National Association of Realtors said its pending home sales index declined 1% in February and was down 4.9% from the year before, marking 14 consecutive year-to-year declines. An economist for the trade group blamed low inventories and rising prices, especially in western states, for dampening demand. Realtors expect to sell 5.3 million houses in 2019, which would be down 0.7% from 2018, which was a three-year low. The Bureau of Economic Analysis said personal spending rebounded slightly in January, rising 0.1% after a 0.6% decline in December. Personal income fell o.1% in January, lowering the personal saving rate to 7.5% of disposable income. In the same report, the Federal Reserve’s favorite measure of inflation showed a 1.8% year-to-year increase, the lowest since October, suggesting inflation was not an imminent concern. The report included incomplete data for February with the rest of the results to be released next month because of disruptions from the government shutdown. The annual rate of new home sales rose more than analysts expected in February, up 4.9% from the January pace and 0.6 higher than the year before. The Commerce Department reported the pace of sales was the fastest since last November, and though inventories remained relatively thin, they were above the 6-months’ supply level for the ninth month in a row, suggesting a sufficient number to sustain the sales pace. In another sign that economic recession is not a near-term worry, the University of Michigan consumer sentiment index rose in March to its highest level in five months. A Michigan economist said more households—especially in the lower two-thirds of income distribution—expect higher income and lower inflation this year. The economist said data still showed signs of economic slowdown, probably resulting in fewer sales of cars and houses.